Ogie Alcasid is set to do a movie with Star Cinema. 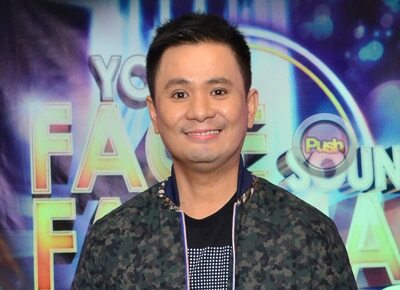 Singer-songwriter Ogie Alcasid revealed he signed a contract with ABS-CBN during the grand press conference for Your Face Sounds Familiar: Kids's edition where he was introduced as one of the judges. "Yes. The possibilities are boundless and no boundaries," Ogie light-heartedly said, adding that the contract, which allows him to do teleseryes and movies, is multi-platform. Talking about his deciding factors as to why he transferred networks, the veteran musician, considering his music career first and foremost, admitted that he got attracted by the network's platform for music. "Dito ko nakita 'yung platform nila for music was what really attracted me most... Siguro alam niyo naman na most of the theme songs I've written are all with ABS-CBN, Star Cinema and 'yung kanilang mga teleseryes. So, nagkaroon ako ng relationship actually with ABS-CBN because of that even though I was with GMA or with TV5. I was still writing for ABS-CBN. And it came from them, they approached me to write," Ogie said, sharing that he also produced an album for Kapamilya star Piolo Pascual that became triple platinum. "My connection with ABS-CBN, from then on, has been with music. And as you remember, if you saw it in ASAP, they gave me a wonderful tribute which really, I'm so thankful. So nakita ko. It really made sense to me that I can keep creating music with the music platforms that ABS-CBN has. I'm not saying that the others don't have one but theirs really made sense to me because of that relationship. It's been going on for many years," he added. Ogie also talked about the network's acting projects for him given that he is also an actor and a comedian. "They have those programs na bagay ako," he said, although not disclosing the specific shows. However, should there be an offer to join the Sunday gag show "Banana Sundae," Ogie admitted he would need to think about it first as he respects his friends from Bubble Gang, the rival network's gag show which he was a part of. "Pag-iisipan ko ng mabuti 'yan. But... 'Pag dating sa comedy, I'm more inclined to doing probably a sitcom or movies with Star Cinema... Of course (it's the friendship with his former co-stars, particularly Michael V. that makes him think twice). Malalim 'yun, eh. But I'm sure he'll always understand," he said. Moreover, Ogie said that he wants to do movies again. "I haven't done a movie in three years yata," admitting that he is set to do a movie with Star Cinema. Now that he is a part of the network, Ogie said that he would like to work with the Kapamilya singers, Judy Ann Santos, and Vice Ganda if given the chance. Currently, Ogie is the newest judge of "It's Showtime's" Tawag ng Tanghalan.